I made a pseudo tzatziki recently and I explained to those invited for lunch that if I could at least get cow’s milk plain yogurt then I could at least have something resembling real tzatziki. I’ll probably never get my hands on sheep or goat’s milk yogurt but cow’s milk yogurt would work so much better than pseudo sour cream. At least, then, I’ll be able to include some type of yogurt. “I have a yogurt maker that used to be my mom’s. I think she barely used it and I don’t use it at all,” I hear from across the table. One week later and a knock on the door, I was handed an orangish rectangular device with six white topped cups under a transparent amber lid.”Take it,” she said. This past Sunday, I decided to put my newly acquired machine to use. Unfortunately, there was no manual, no box, nothing. So I was left to the Internets as a source for yogurt maker recipes. No two recipes were alike but most had enough similarities with their ingredients and quantities that I could turn mad scientist and possibly create something that vaguely comes off as yogurt. Around a quart or liter of milk (skim, low-fat, or whole.) Powdered milk for thickness. Finally, a few spoons of plain yogurt to get settled in with the milk and start a new community of bacteria fermenters. One problem, plain yogurt. Would that sugar heavy natural flavored Activia yogurt that I sometimes see in the store work? If so, then I could make yogurt a few times and with each new batch, seed with the previous batch until all the extra sugar, corn starch, gelatin, or whatever added junk were sent to negligible levels. I decided to use whole milk since various sources stated that it converts the fastest. One liter went into a pot along with about one cup of whole powdered milk. Some recipes said to either heat the milk to a certain temperature or to a boil. I decided to heat the milk up until it was about to boil–stirring the whole time to prevent burning. Afterwords, I covered the pot and allowed the milk to cool to room temperature. When cooled, I mixed in the yogurt and added the mixture to the cups and finally into the incubator they went with their tops snugly secured. The yogurt maker has no settings, switches, or knobs. Only a simple orange light so that you know the contraption is on. About 20 minutes later I checked to see if the heat was being evenly distributed. The unit was a lot warmer in the center than outer regions so I came up with the brilliant plan of moving them around every hour. Hey, maybe that’s what they tell you do in the manual. 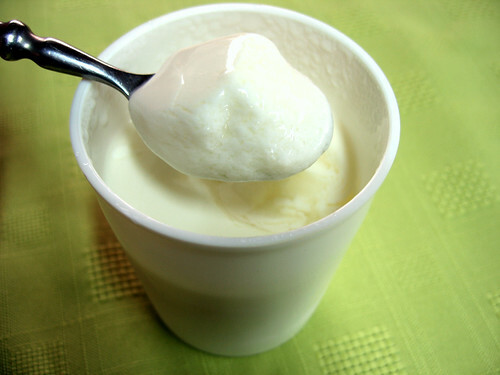 One yogurt machine recipe said that in 4 hours with whole milk, you’ll have yogurt. Well, that’s with their maker but what about mine? At 4 hours the mixture looked no different than what I started with. I did a little taste test to make sure nothing funky was occurring. Not much difference in flavor either. Go on, give them two more hours, I said to myself, what’s the worst that could happen if it doesn’t work out? Sent to the hospital due to some harmful odorless or colorless bacteria that has been growing exponentially in this warm milky bath? Two hours later, the liquid in the two center cups were no longer wildly sloshing around when rotated. (I had to let the remaining cups enjoy the heat spotlight a bit before they were ready) Could this be it? Will this be the beginning of a deep long lasting relationship with my new bacterial friends? The suspense was killing me as I slowly removed the tight plastic top. Finally, I was greeted with a creamy white substance floating around in a clear warm broth of whey. Yogurt, is that you? Surprise! There was more whey than I anticipated but definitely a lot of gel action going on. There was still some flavors remnant of the starter but I could sense that I was closer to the real deal. Fresh tasting. Thick and creamy. Although, it wasn’t as sour as I was expecting. Also, I’m still alive after eating a cup yesterday. Before starting on batch two I think I’ll do a little more research. Batch two will also let me know if any of the thickening agents used in the starter played a role in how thick the yogurt turned out. If anyone has any tips or suggestions, please pass them along.